For this chart, we took the three most popular systems for each category, and tracked their popularity changes, normalized to 100 for January 2013. 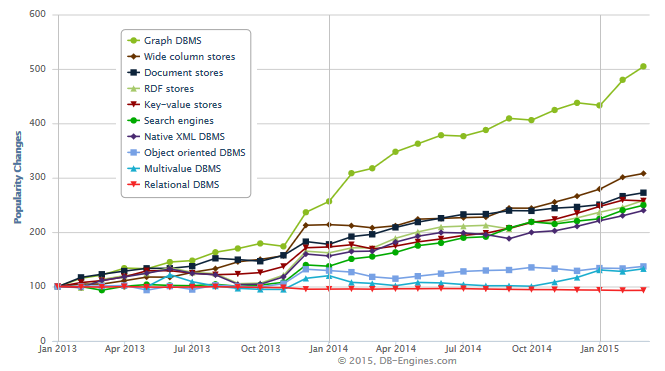 While RDBMS are quite stable, all other categories gained in popularity and Graph DBMS increased by more than 500 percent. That said, we want to mention, that Relational DBMS are still much more popular than any other type of DBMS: they account for 82% of the total popularity score of all systems listed on DB-Engines and 7 out of the top 10 systems in the current ranking are relational systems.